Welcome to Questar III’s Rensselaer Academy for the 2017-2018 school year! We are looking forward to building our relationship with you as we all work together to help your child maximize his or her potential. Parents and families are important partners in the education of our students, and we here at Questar III value your input. Please call your child’s teacher at (518) 396-3520 if you would like to schedule an appointment to discuss any concerns, ideas, or suggestions that you might have regarding your child’s education. 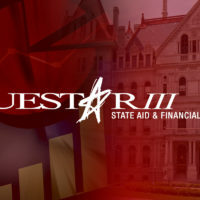 Our education program will run from 7:45 a.m. – 1:50 p.m. and follows the Questar III calendar, a copy of which is enclosed. In the case of inclement weather or other emergency situations necessitating school closing or delay, “Questar III Rensselaer Academy” will be listed on all major TV stations or their websites as part of the school closing network. All students attending Rensselaer Academy will receive a breakfast and lunch meal at no charge, regardless of household income, through the Community Eligibility Provision program. Extra portions and snack items are available for purchase. As the school year progresses, additional information about our program, important dates (staff development days, vacations, etc.) will be sent home periodically. Our school faculty and I look forward to working with you and your child. If you have any questions or concerns, please do not hesitate to contact me at (518) 396-3520.